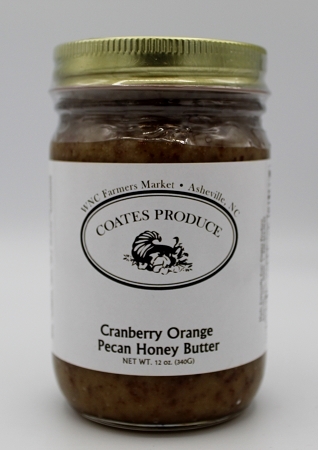 Cranberry Orange Pecan Honey Butter is smooth spreadable honey butter with pieces of pecans mixed in. It is amazing on toast, biscuits, ice cream, bagels, pancakes or even in your oatmeal. Ingredients: powered sugar, honey, margarine, water, salt, contains less than 2% of soy lecithin, vegetable mono and diglycerides, potassium sorbate, citric acid, natural and artificial flavor, beta carotene, vitamin a, pecans, water, cranberries, natural orange flavor, cranberry flavor, orange peel.